The TPP (Trans Pacific Partnership) has moved one step closer to becoming law in the US after the Senate voted to give Fast Track authority to the President. The TPP however must really be considered as 1 of 3 mega treaties designed to give unprecedented control of the world’s trade to giant multinationals including there Big Pharma and Big Biotech companies. The other 2 parts are the TTIP (Transatlantic Trade and Investment Partnership) and the TISA (Trade in Services Agreement); together the TTP, TTIP and TISA form the 3 T-Treaties to cement the corporatocracy as our global ruler. The TTP is focused on 12 countries in the Pacific which contribute 40% of the world’s GDP (US, Japan, Australia, Peru, Malaysia, Vietnam, New Zealand, Chile, Singapore, Canada, Mexico, and Brunei) while the TTIP harmonizes trade between the US and the EU. The TISA included the US, EU, Australia and other nations (totaling 24) and aims to privatize the worldwide trade of services such as banking, healthcare and transport. “Well, let me tell you, what you have to do to read this agreement. Follow this. You can only take a few of your staffers who happen to have a security clearance because god knows why this is secure. This is classified. It’s nothing to do with defense. It has nothing to do with going after ISIS. It has nothing to do with any of that, but it is classified. So I go down with my staff that I could get to go with me, and as soon as I get there, the guard says to me, hand over your electronics. If the TPP were really good for Americans, why the secrecy? Why not openly let anyone read the text and decide for themselves? “The very word secrecy is repugnant in a free and open society,” as JFK famously said in his 1961 Waldorf-Astoria speech where he exposed the insidious influence that Secret Societies were having on the USA. He was killed for going against these secret groups. Incidentally George H. W. Bush, who was heavily involved in the JFK assassination, just so happens to be part of Secret Societies like the Skull and Bones Club of Yale University, as well as others like the Bohemian Club which engage in mock (or real) Satanic ritual at Bohemian Grove. The following are 5 specific ways the TPP will affect you as an average citizen in the US, Australia, New Zealand or any other TPP nation. 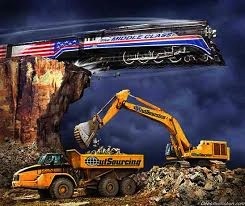 The most obvious way the TPP will hurt lower or middle class Americans is through the outsourcing of jobs. We have already seen the disastrous effect of NAFTA in this area. Now, American workers will have to compete with those in Vietnam (who get a minimum wage of around 52 cents an hour) and Mexico (who get a minimum wage of around 62 cents an hour) according to this source. Did you know that Brunei does not even have a minimum wage? Why would a corporation pay $15, $10 or even $7.25 when it could pay its workers less than 70 cents per hour? How this will affect you: the TPP could well mean that many people working minimum wage jobs will have to work for less, or lose their job outright. The internet has been a 2-edged sword in the battle for freedom. It has allowed the elite to conduct mass surveillance on the populace in an unprecedented amount; however, it has also allowed for fantastic freedom of expression and the swift sharing of information. Now, more than ever before, you can get real news and analysis about events as they break, rather than the usual mainstream media spin and propaganda. To counter this, the elite have bringing in their cherished tactic of “copyright” as a stealthy method to enact censorship and stifle freedom of expression. The less freedom of expression there is, of course, the more they can get away with their schemes of centralization of power. Even bloggers, authors, documentary makers and others who want to use excerpts of copyrighted work for purposes of criticism may be limited by the proposed “Three-Step Test” language which puts restrictions on fair use. This chapter of the TPP will also place new demands on your ISP (Internet Service Provider), requiring them to become digital police. They will be expected to surveil what their users access on the Internet and to enforce copyright law! How this will affect you: the TPP will require the signing nations to adopt criminal sanctions for those found guilty of copyright infringement, meaning you could end up in prison for sharing music, videos or other things online. 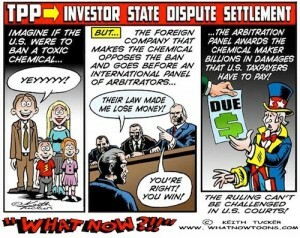 The ISDS tribunal of the TPP would create corporate courts above national sovereignty. Another disturbing feature of the TPP is the pushing of IDIS (Investor State Dispute Settlement) tribunals as a replacement to the legal judicial courts of nations. It’s another stepping stone to the One World Government. The IDIS mechanism is essentially a private corporate court, an international tribunal of private lawyers, who would have the power to award compensation money to big corporations if they found that a TPP nation’s laws prevented that corporation from making money. In other words, big corporations would get “lost profit” dollars and the taxpayer of that nation would have to foot the bill! – Philip Morris is trying to use ISDS to stop Ecuador introducting new laws to protect its consumer from cigarettes/tobacco. How will this affect you: the TPP will mandate that your nation will no longer be able to make laws banning toxic products (e.g. pharmaceutical drugs, GMO-laden food, etc.) and that you will have little or no legal recourse if you hurt, damaged or poisoned by them. “The purported aim of the Annex is to facilitate ‘high–quality healthcare’ but the Annex does nothing to achieve this. It is clearly intended to cater to the interests of the pharmaceutical industry. Nor does this do anything to promote “free trade”: rather it tightly specifies the operation of countries’ schemes for subsidizing pharmaceuticals and medical devices with the aim of providing greater disclosure, more avenues for pharmaceutical industry influence and greater opportunities for industry contestation of pharmaceutical decision making”. She later states that the TPP “is clearly intended to target New Zealand’s Pharmaceutical Management Agency (PHARMAC)” while others have discussed how other nations in the TPP like Australia may be forced to adopt US-style healthcare – a system which kills around 225,000 per year (including 106,000 from adverse effects of Big Pharma drugs) according toDr. Starfield’s study. This provisions also aims to make it very difficult for makers of generic drugs to compete with Big Pharma’s brand-name drugs. The idea is to force all the other TPP nations outside the US to use only brand-name drugs. Additionally, did you know that Big Pharma through the TPP is pushing for patents on animals and patents on surgical methods? How can Big Pharma possibly claim any basis for being able to patent an animal given the longstanding tradition of patents not been granted for things in and of Nature? How this will affect you: How would you like it if your surgeon told you he/she could not operate on you because a particular surgical technique was copyrighted and private property? How would like having to pay more for “brand-name” medicine because the exact same kind (the generic kind) is deliberately unavailable? “Instead of committing TPP countries to “adopt, maintain, and implement” the laws, regulations, and all other measures to fulfill its obligations under MEAs and subject those obligations to dispute settlement, each TPP country is merely committed to “affirm its commitment” to implement the MEAs to which it is a Party (Article SS.4.1). So the benchmark has been changed from being legally required to adopt and implement environmental policy – and facing court and fines if they don’t – to merely affirming commitment. Do you think soulless corporations and their sociopathic CEOs are honorable enough to uphold environmental standards without being legally and financially forced to? If you do I have some oceanfront property for you in Colorado and Switzerland. Reminds me of how the supposed constitutional lawyer Barack Hussein Obama swore to uphold the US Constitutioon and then proceeded to form Kill Lists to extrajudicially assassinate people (including US citizens abroad) and sign laws like the NDAA which allows the US Government to indefinitely detain Americans without charge or trial (4th Amendment anyone?). How this will affect you: Expect less environmental safeguards and more ways the corporatocracy can poison the environment without having to face any legal or financial consequence. The Trans Pacific Partnership is another stepping stone to the totalitarian New World Order, by the gradual creation and merging of economic unions and free trade agreements. Spread the word about it.